Carol Ebert is a MSN, RN and works as a Certified Wellness Practitioner. Recently I have been bemoaning the fact that I am getting older (tho still feel young in my mind) but the language that exists to describe this stage of life is so demeaning, discouraging, focused on deteriorating and not descriptive of what my life experience is right now. Right now we think that after 60 it is all downhill from here. We even celebrate “0ver the Hill” parties! But that assumes we are “done for it” and many of us don’t feel that way at all. Isn’t there a better way to frame this time of our life? Well, the good news is that there is! A good friend turned me on to Jane Fonda’s TED Talk called “Life’s Third Act” and I was transformed! That is the language I was looking for. I’m in my Third Act – the last 3 decades of life - and I get to write my own book about what that means for me. What is the appropriate new metaphor for aging? We have to get over the fact that older ages are not all about pathology. Many of us (me too) are not riddled with disease, but are healthy, vibrant, energetic, filled with potential and ready for more. Fonda also says: It turns out, most people over 50 feel better, are less stressed, less hostile, less anxious. We tend to see commonalities more than differences. Some of the studies even say we're happier. So this is all good news for those of us who struggle against a culture that tends to discard our value and not appreciate what we can offer. We - the over 60 generation who were such idealistic free thinkers in our youth are not going to go quietly into the good night. 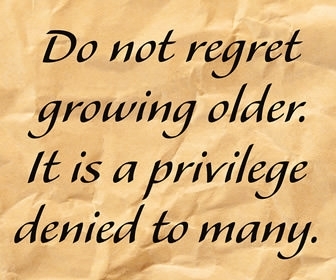 We are creating a new paradigm for aging and it focuses on being - and feeling - ageless. Dr. Christiane Northrup, OBGYN, women’s health pioneer and best selling author even wrote the book Goddesses Never Age referring to older women as Ageless Goddesses. I prefer thinking of myself that way as well because the number of my age does not correlate with how I perceive myself. In my mind I am still 35 which is about half of my chronological age. Carol Osborne, author of The Spirituality of Age: A Seeker’s Guide to Growing Older says coming of age is the opportunity to not only grow older, but to grow whole. It is a life stage of value and purpose of its own. Gail Sheehy best-selling author of New Passages: Mapping Your Life Across time presents startling facts: A woman who reaches age 50 today – and remains free of cancer and heart disease – can expect to see her ninety-second birthday. To plot our route across these vast new stretches of Second Adulthood, we need a new map of adult life. From my perspective I feel like I’m just getting started. All those years of working and experiencing things was like an internship and now I am ready to go out on my own and prove to myself I can do anything I set my mind on. I am free from the shackles of working for a boss, in control of my time and destiny, healthier and more physically active than most at my age and looking forward to what I can create next. Is aging on your mind? What are your thoughts about your third act of life? Will you continue working in nursing? What dream do you have that you want to pursue beyond your nursing career? All these questions are valid and important for you to process, because your next 30 years might be the best and most rewarding of all. Thanks for this timely article. (Timely for me; I will turn 60 this year and having trouble believing that.) I've been retired a year but just recently decided to stop doing prn work. Now I'm really free! I'm working on navigating this new phase of life and developing structure that isn't imposed from without. It's been harder than I thought. So thanks for the article and the references. I actually have the Northrup book; just need to finish it. Will have to check out Sheehy and Osborne. Good article! safetypin has 2 years experience as a BSN, RN and works as a Pediatric & Neonatal Nurse. A member of my family has just passed away that did not have a chance to embrace his Third Act- and a decade ago lost his wife before they were able to enjoy their Third Act. He and I are so similar, personality and health-wise- this is why I worry. However, I'm doing what I can to embrace life now and hope for a Third Act. I just turned 60, and this article gives me hope for the future. I'm not in the best of health--in fact, I became disabled at 55 and am on Social Security. But I've developed an attitude of gratitude for what I have instead of always wishing for what I don't, and I've come to believe that is the beginning of wisdom. So is knowing what I don't know. I hope to continue to grow in wisdom in my Third Act and pass it on to my grown children, who are gracious enough to listen sometimes. I turned uh 60 last year and fortunately am very healthy. I do plan to work at least another 5-7 years full time and then probably go part time. My husband who is older will retire this year in June. However, he too is a "busy" person so will cont to volunteer and keep busy. Hancock330 works as a Retired. It's impossible for me to express any pleasure in anything said by Jane Fonda. With a background where several family members were active duty military during and immediately after Viet Nam her behaviors, not ever adequately apologized for, make her useless to me. That said, I've found that having gray hair (and all that goes with that minor change in appearance) has definite disadvantages. I have been almost patted on the head while a much younger female server at a restaurant praised me for eating all of my salad, for instance. I can't tell you how many younger males in various settings have called me "young lady" as if it should be perceived as a compliment. All I'm asking is to be treated with respect appropriate to the various situations. I've been an adult for a LONG time -- and I'm NOT in my second childhood. I've worked hard to get to this place in life where I can spend a lot more time doing what I want to do with almost all of my time -- and I want to enjoy as much of my life as possible. I find I'm relieved not to need to work any longer -- though I enjoyed many of the jobs I had in the 43 years I worked as a registered nurse. My recent 50th birthday brought many of these types of thoughts to the forefront for me. What does my future hold? How much longer do I have to make the kind of difference I always thought I'd make? Nursing was a second career for me, and "being the change" I want to see in healthcare has not yet panned out for me the way I'd hoped. What I can say, though, from a lifetime of interacting with my elders is that age imparts a beautiful brand of wisdom, borne of experience. We'd all do well to respect and honor that wisdom more. I'm 63, and I look and act my age. I ride my bike, go out walking, play with my hobbies, and I work about 30 hours/week. I enjoy my work. Likely, I'll work another 7 or 8 years, as long as I'm enjoying myself. I have noticed that I don't have the endurance that I once had. That doesn't mean I can't do what I want, only that I need to listen to my body. One or two 12-hour shifts in a row are OK. Three in a row . . . not so much. One very nice benefit about working private duty home care is that I can reduce my hours if needed. Or if wanted. I do use my gray hair to my advantage. If I hear the neighborhood kids cuss, I say, *gasp* "Oh! That naughty WORD you said!" And they apologize! If they have their car stereos turned up too loud, I can tap on the window with a smile and pantomime turning it down, and they will. I gladly accept help, whether it's opening a door, or lifting something for me. Or whatever help they give. It isn't demeaning, or an indication that they think I can't do these things for myself. No, they are being polite and helpful, and I say, "Thank you." I would like to take more time to visit shut-ins, and any older people who just want to visit for a while. I can brighten a person's whole day! Right now, between work and helping my extended family, I don't have a lot of free time. At some point, that will change. Thank you for a great article. I find it interesting how several strong voices on this site just confessed to being 60ish. Me too, as of two weeks ago. I pictured many of you as being a little younger, but I should have known that such wisdom and the ability to share it articulately grows over time. The Third Act designation is excellent. I'm proudly adopting it as the new description of my station in life as I continue ER nursing indefinitely while speaking out against the profiteering and exploitation plaguing healthcare delivery in the U.S.